I’ve been wanting to make caramel corn for years, but whenever I asked Cornelius if he wanted any, he always said no. Can you believe that I married someone who couldn’t care less about caramel corn? It just didn’t make much sense to me, so when I prodded him further he told me that he just didn’t like it. Crazy, right? He told me that his grandma made caramel corn and it was sticky and too sweet. I said, do I look like your grandma? Actually, I never said that, but you get the gist. Me, I grew up with caramel corn….sort of. What I mean is that I grew up with a homemade caramel sauce that was pretty identical to the recipe below. But instead of baking the popcorn for an hour in a slow oven, my mom and I just poured the sauce over some popcorn and we called it done. Popcorn was always a last-minute snack so waiting for an hour didn’t make sense to our impatient bellies. Sweet? Yup. Sticky? Definitely. So I was curious to see what baking the caramel corn would do. Let me tell you that it does all the right things. The resulting popcorn was light and crunchy – not sticky. It wasn’t too sweet and it had a hint of cayenne and a touch of salt. I leaned to more popcorn (12 cups opposed to 10 cups) and I loved it and surprisingly, Cornelius loved it too. I liked the triumvirate of nuts: pecans, pepitas, almonds. The pepitas especially were particularly rich and buttery and helped to make this popcorn off-the-hook amazing. 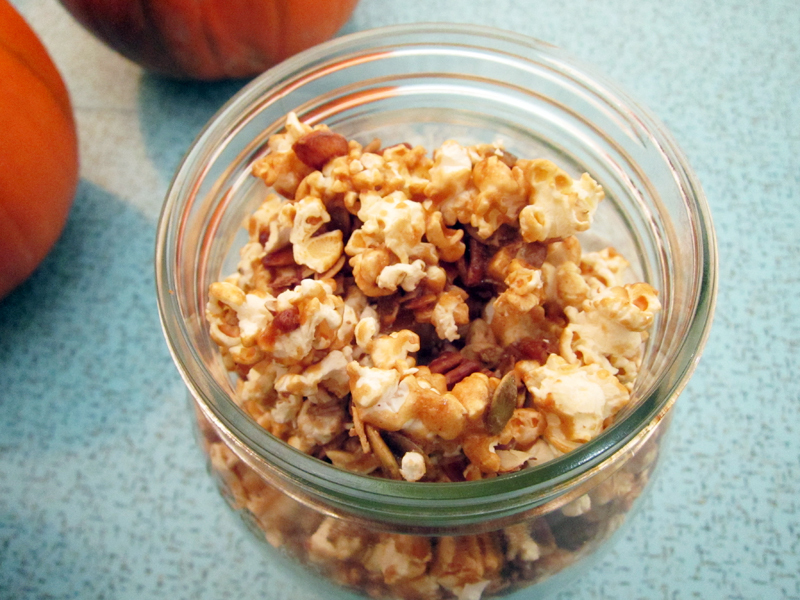 This caramel corn also would makes a perfect gift in case you feel like sharing it around. Packed in a mason jar and tied with red and white twine it’s almost too cute to eat. Almost. Don’t let the recipe length fool you. This is simple stuff and it’s worth every word and more. Pass it around or be rightfully greedy and stuff it into your face as soon as you can. Once you’ve popped your popcorn (I like hot air popped corn – I’m a product of the ’70s! ), go through and remove all unpopped kernels. Someone once told me these were called widows which just seems cruel. 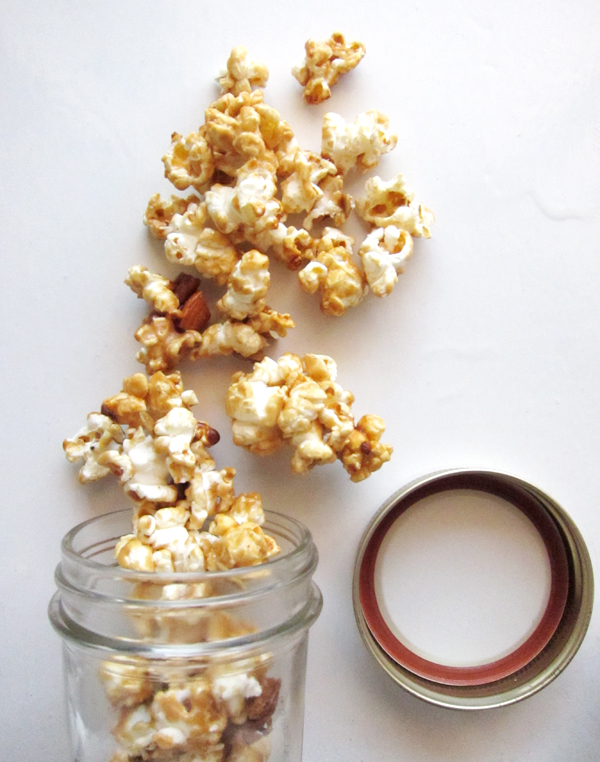 Dump popcorn into your biggest bowl – if you don’t have a big bowl, try your biggest stock pot. In a medium saucepan, melt butter, brown sugar and corn syrup together along with 2 tablespoons water. Bring to a simmer over medium-high heat. Continue to simmer for 3-4 minutes, whisking often. If you’ve got a candy thermometer, it should read 250°F. Immediately remove from heat and stir in the baking soda, vanilla and cayenne pepper. Quickly pour the hot caramel over the popcorn along with the nuts. Use a rubber spatula to distribute the caramel evenly by folding it gently. 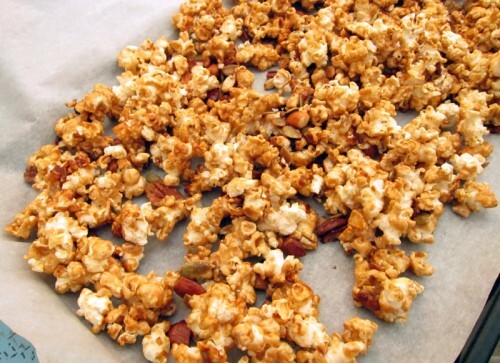 Transfer the popcorn onto 2 baking sheets lined with parchment paper or silpat mats. Sprinkle with sea salt if desired. Bake for 1 hour, stirring often and turning the pans to make sure that the heat is evenly distributed, as the popcorn can burn if not watched closely. Remove from oven and let cool for 15 minutes. Gently break up popcorn and store in a tightly lidded container. Keeps in a tightly lidded jar for up to 2 weeks (or more), but like that’s going to happen. I feel like the nuts are a key addition and that little extra fat they add does a lot to combat all that sweetness! I know I wouldn’t be able to resist digging into this, scoop after scoop! Yum. This looks like such a great snack. 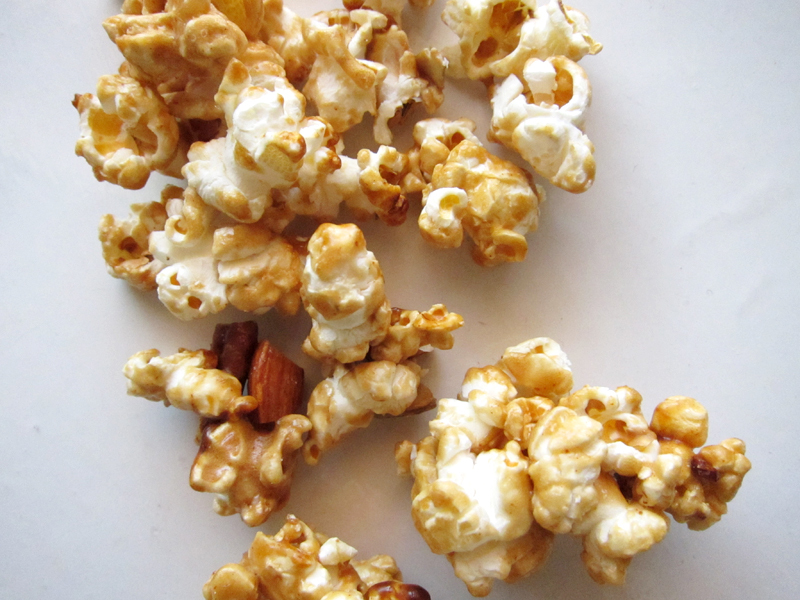 I love caramel popcorn and the nuts and pepitas will only make it more addictive! Yum! Looks amazing, I adore caramel corn! I think the pepitas would be perfect. I’m always looking for good holiday treats to give as gifts (and eat of course). My mom, who is a very careful and healthy eater, would totally go off her perpetual diet for Poppycock, a overly sweet popcorn concoction that my dad would get as gifts every year. I’d love to make her the real stuff! YUM! My husband will love me if I make this for us on a stay in and watch a movie night! Perfect timing, it’s gotten so dark and cold in Vancouver and this will hit the spot. Sara, me too – popcorn & nuts are the best. Joanne, agreed. And if you make this, you won’t be able to resist. It’s that good. The pepitas help make this extra special, I think. Thank you, Foodess! Dana, this is the perfect holiday treat! Make your mom a batch – she’ll love it. This is waaaaay better than Poppycock!!! Ashley, I love popcorn and couldn’t live without my air popper – but you could just as easily use stovetop or microwaved here. I’m totally going to a huge batch and give as presents for Christmas…if I don’t eat it all. Looks amazing. And who doesn’t love caramel corn?!! I’m definitely going to make this one day. I make popcorn in a pot often so this would only be an extra delicious step. I just know I will eat too much and hate myself for it afterward but I just can’t deny myself this delicious pleasure 🙂 Hmm, I wonder if chipotle powder would work in the popcorn? Lo, the chipotle sounds AMAZING! I’ll try that next time for sure. I love caramel corn — I will definitely try this one out! I love caramel corn but have been unable to come up with the perfect recipe. Actually a friend of ours in Alaska used to give us caramel corn each year but would not share the recipe… so I’ve been in caramel corn funk since our move 2 years ago! Aside from chocolate, its the only sweet I have loved since childhood but only if its really good! Once I pop out to pick up pecans (and figure out why the carpet in our boys’ room reeks!) this is on my list of things to make. Can’t wait to try it out!! Ooh, nice call on the pretty (and delicious) gifting idea! I like caramel corn a lot and I love your combination of salty and sweet with a little kick of spice. YUM! Thanks Lulu, it’s the bomb. Peggy, I’m sure you’ll love this version – I really do think this is the perfect caramel corn recipe, hands down. It’s that time of year again for caramel popcorn! I love the way the house smells when I start baking this. I’m so excited about cooking this season! Thanks so much Sarena for stopping by! Yes, the smell is amazing and so perfect for the holidays. I’ve been looking for some edible xmas gifts for my friends and fam! I love the idea of putting them in mason jars too. Thanks! Stephanie, I think everything looks better in mason jars. Such a great gift!